Craniosynostosis refers to premature closure of cranial sutures, or joints between the bones of the skull. The condition has medical consequences only when it occurs abnormally early in development. Craniosynostosis occurs approximately once per 1,900 live births, with considerable variation in the shape of the skull. Less severe cases often go undetected. No evidence of inheritability or a recognized syndrome appears in the great majority of patients with premature closure of a single suture. Craniosynostosis can occur as part of a larger pattern of any of a long list of genetic and teratogen-induced syndromes, and many of unknown origin. Primary craniosynostosis may involve one or two sutures in otherwise normal individuals or be part of a recognized syndrome. Secondary craniosynostosis occurs in response to absent or reduced growth of the brain. Because symptoms of craniosynostosis are apparent in infancy, the complaints are usually those of the parents concerned about future adverse effects. Symptoms such as headache, seizures, drooping eyelids, double vision and visual loss are rare. Scaphocephaly refers to an abnormally long and narrow cranium. Caused by premature closure of the sagittal suture, this is the most common type of single suture craniosynostosis. Trigonocephaly refers to a triangular cranium with a prominent vertical ridge in the midforehead. Cause involves premature closure of the metopic suture. 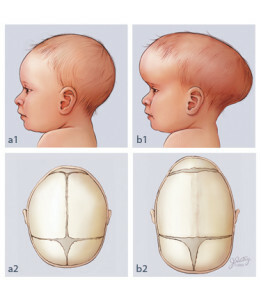 Plagiocephaly refers to an abnormally asymmetrical cranium, which is typically flattened on one side. Cause involves premature closure of the coronal suture on one side. Brachycephaly refers to a broad skull with a short base and a recessed lower forehead. 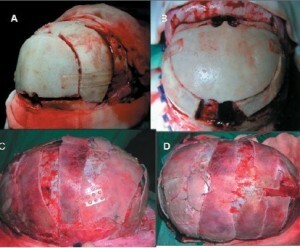 Cause involves premature closure of the coronal suture on both sides of the head. Oxycephaly refers to a pointed skull. Turricephaly refers to a very high or towerlike skull with a vertical forehead. 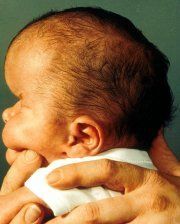 Physical examination is usually sufficient to diagnose craniosynostosis. A bony prominence over the suture that has closed prematurely typically is evident. Plain x-rays demonstrate a lack of normal decrease in bony substance in the center of the suture. Gentle but firm pressure with the thumbs fails to cause relative movement of bones on either side of the suture. In prematurely closing sutures, increased activity compared to the other sutures will be demonstrated. Not all children require treatment. 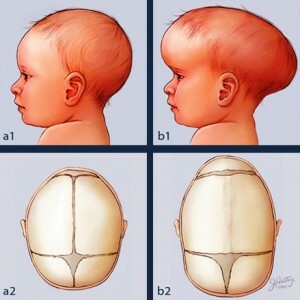 A child with a head of normal or near normal shape does not need surgery for craniosynostosis. A head that has not been recognized as abnormal in shape in the first 6 months of life will almost never require surgery. Surgery is indicated for patients with cosmetic abnormalities or elevated intracranial pressure caused by limited room for the brain to grow. The goal of treatment is to correct the abnormality in cranial shape and/or volume. Cosmetic abnormality is an important indication for surgery. The cosmetic abnormality will usually get significantly worse with growth, and it may affect facial shape as well. Surgery is not required to prevent mental retardation, blindness, seizures or headaches in the vast majority of cases. No amount of surgical expertise can produce a perfect result. The aim of cosmetic surgery is to change the appearance from one that attracts unfavorable attention to one that does not attract attention. Risks encompass those related to general anesthesia, wound infection, loss of blood and transfusion, which is often required. These risks are small. Most severe complications and deaths from surgery for craniosynostosis are related to blood loss. There also is a risk of injury to the underlying brain that can cause significant neurological abnormalities, including weakness and seizures. Nearly all children operated on for premature closure come out with an improved appearance.